The park has been created in 1983 by amalgamation of three sanctuaries- Rajaji sanctuary(estd. 1948) Motichur sanctuary (estd.1964) and Chilla sanctuary (estd. 1977) after the name of renowned statesman and freedom fighter Sri C. Rajgopalachariya – The first and last Governor General of independent India popularly known as “Rajaji”. A delight for wildlife lovers, adventure seekers and travellers, rajaji national park, is spread over an area of 820.42 SQ. K.M. It is a home of 23 species of mammals and 315 species of Birds, which could count to 500 with several migrating species. Chilla Wildlife Sanctuary, a heaven for animal watchers is just 8 kms from Haridwar and 21 kms from Rishikesh. Located on the banks of the Ganga River in the heart of Shivalik hills. Chilla is a part of the famous Rajaji National park. 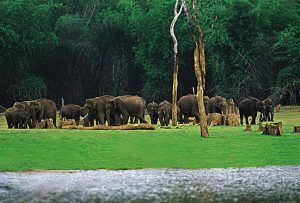 The fauna include Elephants, Spotted Deer, Stag Deer, Neelgai Bull, Wild Bear, Fox, Porcupine, Jungle Fowls and Peacocks. Beside these, migratory birds are also seen on the river Ganga. There is a Tourist Rest House in addition to a Forest Rest House. Dhikala tourist place is a part of famous Jim Corbett National Park, the first national park of India. The entrance in this place can be made as per rules of Jim Corbett Park during opening season of the part from mid November to mid August. This part is famous for its bio-diversityand wildlife. 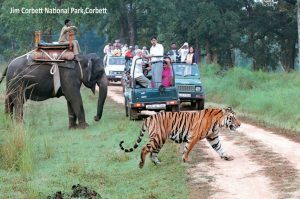 Jim Corbett Park has a total area of 1318.54 square km. Out of which 912.67 square km. comes in district Pauri Garhwal. Dhikala is generally overloaded on New Year day, Holi, Bhaisakhi and weekends by tourists from all over India, which come here to natural beauty, wild life and bio-diversity.